Trout and the Flat Earth Society. Now it strikes me that if I were a trout in a catch and release stream it wouldn’t take too long for it to dawn on me that most of the sh1t in my life came from “up there”. You know above that little silvery window that is the ceiling of my aquatic world. Fish eagles, otters, kingfishers (at least when I was little) and of course anglers, plus like a small child afraid of the dark I wouldn’t have a particularly good feeling about stuff that I can’t see and my view is limited at the best of times. So rather as humankind were a bit wary of the horizon in times past and fearful of dropping off the edge of the world so for a trout the outer world would be a little scary. I mean I don’t need to identify every bump in the dark to be fearful of it and, were I a trout, anything untoward, a glimpse of movement or a flash is enough to put me on edge and perhaps even take a runner and stick my head under a rock for a while until the perceived danger is passed. (The ichthyological equivalent of locking yourself in the bathroom). Trout don’t need to identify a threat to be wary of it. I well remember fishing with my fishing mate (and drinking partner) Gordon McKay years back when he was casting and I was “spotting” for him. There he was all lined up on a trout that we could both see clearly in the crystal waters. The fish was feeding away happily, occasionally broaching the surface and unaware of either of us, just doing what a trout does when breakfast is on the table. It so happened however that just as Gordon made his presentation a large dragonfly came bumbling up the stream, casting a shadow like a pterodactyl in the bright sunshine and flew directly up behind the fish such that it didn’t notice until the last moment. The passage of that shadow coincided exactly with Gordon’s dry fly presentation and as the fly was in the air the fish bolted for cover. Poor Gordon, who from his point of view couldn’t see this all unfold simply assumed that he had made some mistake but in all fairness that wasn’t the case at all. The fish bolted simply because of the shadow of a dragonfly that wasn’t in any real sense a threat. Trout don’t like surprises and they particularly don’t like surprises that come from “up there”. Success on a drowned Midge Pattern. Further were I a trout it would come to pass at some point that I might realize that most of the time eating stuff off the surface is a high risk occupation in an environment where most anglers prefer to fish dry fly. It isn’t just a snobbish affliction, we all like the drift of the fly, the vision of a spotted shadow rising on the current to intercept our offering and the glorious heart stopping moment when the mouth flashes white and we try to time our strike, nerves jangling as we attempt to avoid being too hasty. So if I were a trout I think that I would tend to find other sources of food if possible and what better and easier pickings could there be than drowned bugs just under the surface? You see it doesn’t escape me that in the bubbling freestone rivers that I fish most of the time insects that are falling on or hatching from the stream have pretty limited windows of opportunity to escape before they are done in by the next waterfall. The waterfalls don’t need to be huge, if you are a size 20 midge a moderate boulder will create a stopper wave that in comparison to one’s size is like the rapids of the Colorado. For a small bug in a freestone stream drowning is only ever a short drift away. 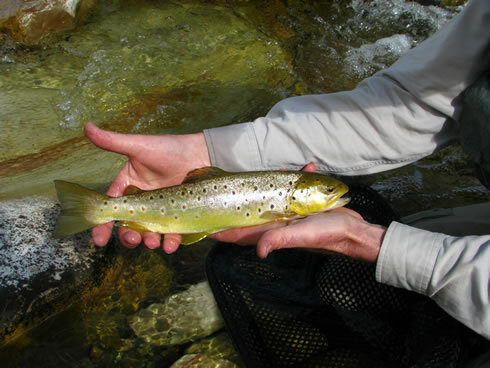 One can look back at the angling literature and there are numerous indications that trout might very well enjoy the easy pickings that lie just under the surface. Soft hackles, emergers, stillborns, Klinkhammers and probably quite a few “low floating” dry flies are all good imitations of bugs that have been swamped. Recently I have been revisiting this idea with a good deal of success, for years I have fished dry flies designed as much so that I can see them as that they imitate the fish’s food but there are problems associated with fishing like this. Not least that the fish are wary of the surface, that drag is all the more noticeable on a floating fly and that no matter what you do you can’t get the darn tippet to sink much of the time. The idea is that by going just subsurface you eliminate many of those problems and with a lot of net winged midges on the water of late I had been thinking that perhaps fishing a fly just under the water I might give myself a better chance of deception. The further advantage is that bugs that have just been given the wash cycle treatment are going to look a little disheveled at best and therefore with my limited fly tying skills it would be a lot easier to imitate them. I mean I just had to lash some stuff on a hook and stamp on it a few times to get the required effect. The only real objection being that I couldn’t see the darn things in the water. 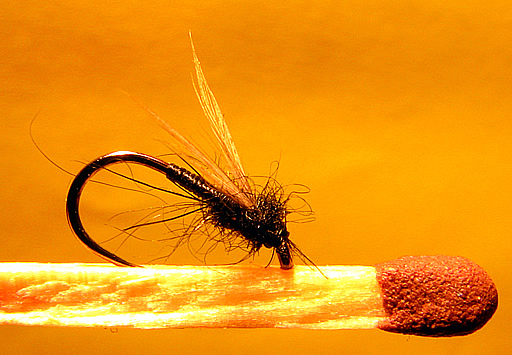 So was born the “drowned midge”, it takes about a minute to tie one, the rougher the better (remember that the required look is sort of microscopic road kill). Fished on a fine tippet to allow the weight of the hook to sink the pattern a few inches and a dry fly to act as an indicator I was ready to experiment. Loose dubbing, a brush with some velcro, a couple of hackle point wings and you are in business. On two recent trips to the stream this tactic has proven to be a real winner, sure a number of the fish eat the dry, perhaps even the majority but the ones that refuse it will frequently take the midge and more to the point will sometimes simply ignore the floating pattern entirely. It also seemed to me that the takes on the subsurface pattern were more positive whereas takes on the dry seemed to indicate that the better fish were eating the thing with what locally might be referred to as “Lang Tande”, (that is “long teeth” for the uninitiated) and indicative of less than true commitment to swallowing the floating imitation. The fly fishes so close to the surface that most of the time you will see the take anyway and you still have the dry as a back up. It is a wonderfully effective tactic and a real “go to” trick when the fish are coming short or offering up inspection and refusal rises, something that seems to be getting more common. Perhaps you might like to try this next time you are on the stream, the fish seem a whole lot more confident in chomping down on some hapless bug that has been swamped and if they can be sneaky enough to avoid eating high floating dries I can certainly be sneaky enough to go subsurface after them. Hook: size 18 moderately heavy wire. Abdomen: Black 70 Denier Thread dressed short. Thorax: Soft black dubbing, rabbit or similar brushed out with velcro. Front Thorax: A pinch more loose dubbing. Brought to you by Inkwazi Fly Fishing Safaris in conjunction with STEALTH FLY ROD AND REEL, suppliers of Gamakatsu Hooks, Airflo Lines, Costa Del Mar Sunglasses, Deep Red Fly Rods, Scott Rods and more.